What’s the sense of strategy? Most of you would answer “Focus”. It’s probably the most used word among the strategists, but what really means? I’m asking because in the daily job, you probably start doing something that your boss asked you to do. And you do it: it’s probably in line with the company strategy, so that’s right. Then the day after, the same boss or another one (nowadays, in the matrix organizations, everyone has at least 2 bosses, but it’s not rare having three or more), will ask you to do other stuff, this time slightly divergent from the common overall strategy. It shouldn’t be like that, I know, but it happens, for whatever reason, it happens. The day after again, and again, and as you can imagine the result of this is a series of actions that lead to nowhere else but to a non place, where people are unsatisfied, unhappy, frustrated, and confused, as well. What happened? Simple: you just said too many “yes“: it was nobody’s fault and everybody’s fault; too many yes give short term results but they take you to long term disasters. 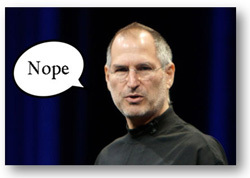 Focus is about “saying no“, it’s what Steve Jobs used to profess in 1997 after joining back Apple. Focus is saying no. Saying no, you really focus on the small steps that day after day make you reach what you want, and what you planned in advance to achieve. through problems with your RSS. I don’t understand why I can’t join it. cut you some slack , nor expect you to get started being living and soul from the party. gain a “foot hold” on the problem.